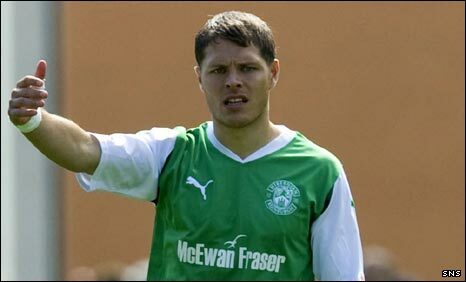 John Rankin says he and his Hibernian team-mates were left "gutted" by the departure of manager John Hughes. Hughes left the club on Monday after a poor string of results running into last season and with Hibs sitting tenth in the Scottish Premier League. "The manager was very popular in the dressing-room," said Rankin. "There were no divisions at all. Everybody was behind the gaffer 100% and the players have to take a huge part of the blame for the results." Rankin believes luck has not been with Hibs this season as they recorded just one win in their first seven league games. But it was a 2-0 defeat away to St Johnstone that eventually led to Hughes' departure and the midfielder said: "We were poor on Saturday and we have to look at ourselves. We have let ourselves down." Rankin, though, pointed out that Hughes had led Hibs to fourth place last season and qualification for the Europa League. "Last season, we did fantastic to get finish in fourth spot. He came in and the expectations were obviously to get into the top six, but the gaffer obviously produced the goods," he told BBC Scotland. "At one point, you are actually looking to split the Old Firm, but the wheels came off the bus and we struggled for a while, but it was no reflection on him." Hibs had sold top scorer Anthony Stokes to Celtic on transfer deadline day, but Rankin could understand why the club had allowed the striker to leave. "Stokesies goals changed games for us last season, but he was desperate to go to Celtic," he said. "He sort of forced the club's hand because he was so passionate about Celtic, the club he has always supported." Rankin pointed out that Darryl Duffy had been signed as cover the previous day on loan from Bristol Rovers and had looked promising in training before suffering a serious injury in training that denied his services to Hughes. Now Hibs' players were turning their thoughts to making amends against Kilmarnock a week on Saturday. "Obviously the reaction amongst the dressing-room was that we were hugely disappointed," said Rankin. "Naturally, we were all gutted and it took us a while to get our heads up, but it is a new era and we are now led by Gareth Evans, who is taking us for training at the moment." Meanwhile, former Hibs midfielder Paul Kane questioned the future of chairman Rod Petrie with the club having gone through seven permanent managers in 10 years. "In any walk of life, if you make two failures, usually the person who makes them doesn't keep his job and in that I mean Rod Petrie," he said. "I know John very well and I would have loved for a Leith man to take the club to the next level. "I am very, very sad that the club were a wee bit short in taking the decision so quick because John gave them what all Hibs fans wanted last year - although it went to the last game, he gave us Europe for the first time in five years."